Kuria is an Eastern Bantu language and therefore belongs to the Niger-Congo phylum, in Guthrie’s classification E.40. The total number of current Kuria speakers in both Kenya and Tanzania is estimated at more than 400,000 (www.ethnologue.org: 604.000, 2005). The data for the present study were mainly collected in Kenya, largely from February until October 1986, and from February up to May 1987. Because there is hardly any information available concerning Kuria dialectology, an explicit and comprehensive statement of the phonological and morphological system constitutes the first priority. An additional observation is that Kuria appears to have been much more influenced by Swahili in Tanzania than in Kenya, although in Kenya the influence of both Swahili and English is also increasing. The paucity of available literature and the state of research on Kuria have been the reasons for undertaking this study. Another reason constitutes the fact that since the 1970s Kuria seems to be changing more and more rapidly than ever before. 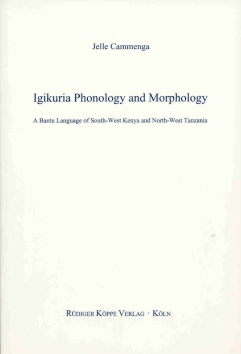 The author presents the Kuria phonology followed by a description of the morphology. Furthermore, three appendices are added. The first offers an updated version of the annotated bibliography of publications on Kuria language and people. The second is a brief list of Kuria literature, the third contains linguistically relevant information on the main informant. The aim of the book is to contribute substantially towards filling the descriptive gap in the subgroup of Eastern Bantu languages, to improve the descriptive state of affairs involving Kuria, and to provide a more reliable basis for future research on it. Researchers working on Bantu languages know that one of the limiting factors is a lack of good, reliable grammatical descriptions of individual languages. [...] Cammenga’s work is a very fine, clearly presented and exemplified elucidation of an important Bantu language. It will be of great use to comparativists, phonologists, and historical linguists working in the field of African languages and provide a reliable basis for future research on Kuria. This work […] has two important aims. One is to document an underdescribed language. As Igikuria is undergoing rapid change, the study also is important in preserving a possibly endangered language. A second aim is to develop an analysis in a non-linear phonological framework of important phonological processes of Igikuria, including morphologically conditioned processes, both as a contribution to phonological theory and to provide an enlarged database for others to test their theories on.